How had I not noticed the male Night Elf’s aquiline nose before now? That thing is fantastic. And here I was, hoping to take a break from the class-specific sets for a while. 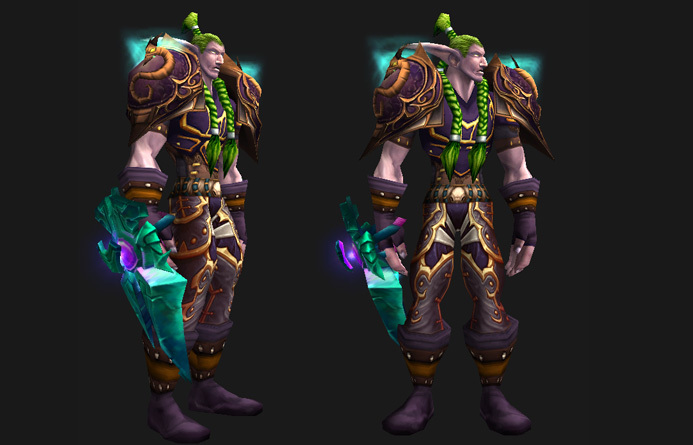 No such luck, those gorgeous and confusingly turquoise-glowing purple shoulders are Druid-specific. The rest of it, on the other hand, is up for grabs. I’m looking at you, surprisingly cool Arm Blade of Augelmir. And, more importantly, what the heck was in those entrails that makes the gaping eyehole glow? Radioactive waste in ICC 10, it’s more likely than you think. First of all, who discards perfectly good entrails? This is a bit of a departure from my usual aesthetic, but I don’t care. Those shoulders are fantastic. 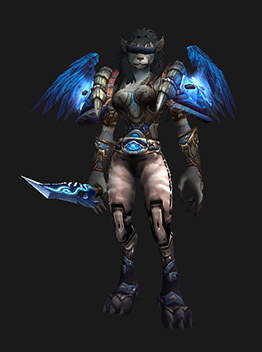 Seriously, take a minute and watch their animation on Wowhead. We’re talking surprise shoulder tentacles, people. The best kind. 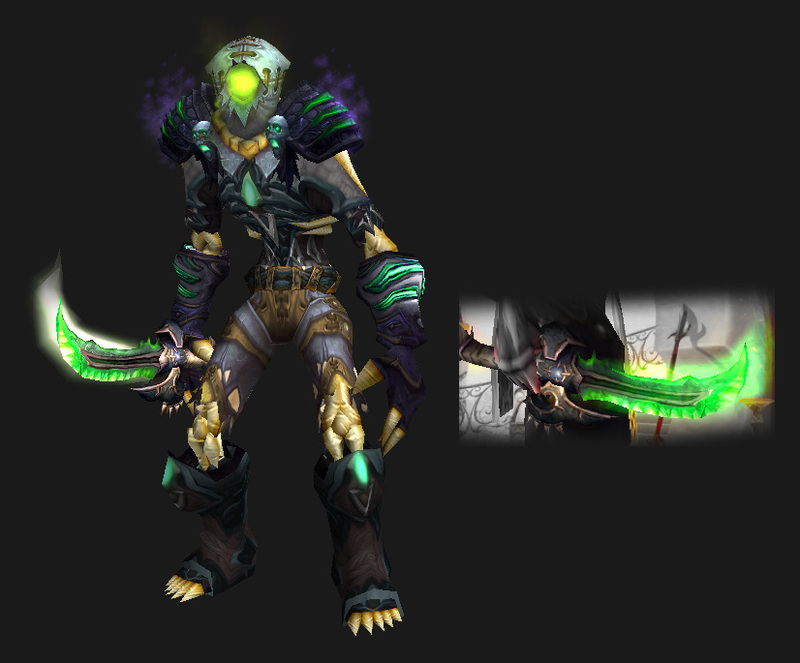 And this is one of the few sets I’ve done where I actually prefer it on an undead model. Apparently, it’s at its best with a few chunks torn out of it. So, I was bored the other day and threw out a challenge to my Twitter followers: Send me a couple of random pieces of gear and I’ll try to build a set around them. @Rommyjordan suggested Lightfinger Handwraps and Cursed Vision of Sargeras, so here we are. If you go down in the woods today, you’re sure of a big surprise — in this case, an enormous stone knife to the face. This is the part where I throw buzzwords at you — like “editorial” and “avant-garde” — to distract you from the fact that this outfit is kind of weird. Look, I know there probably aren’t a lot of people out there who want to wander around in a floor-length skirt with a dead bear strapped to their head. But I do, okay? I do. 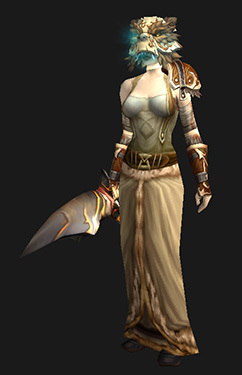 Oh, and something to remember: Hood of Stilled Winds displays strangely on certain races. I’ve heard tale of night elves’ eyebrows sticking out of its eyeholes and, well, check out the Pandaren female transmog model. You’ll be emotionally scarred you did. 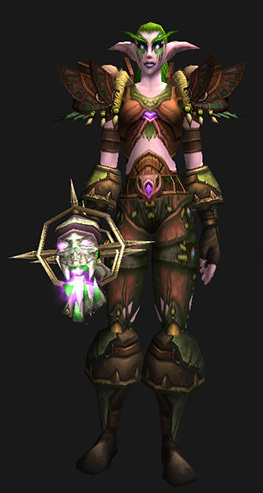 I like the weird mace skull thing. It’s pretty cool. Noblegarden had me thinking plants and growth and somehow this is what I’ve ended up with. Sure, it feels more like a darkened forest than a bright spring day, but I like it anyway. Even if it reminds me of mulch.